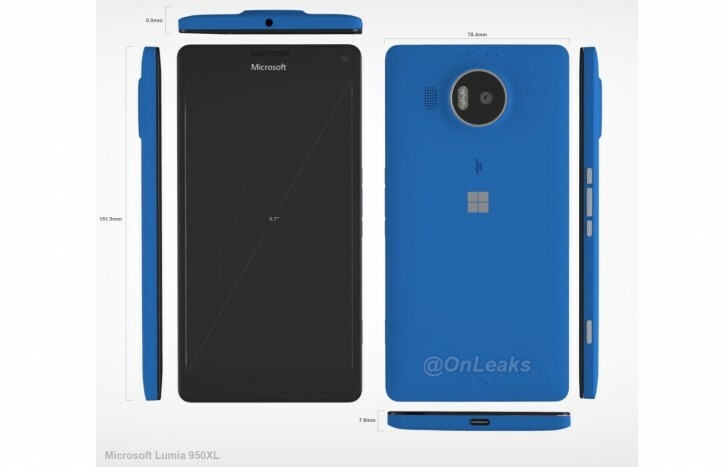 The physical measures of the upcoming Microsoft Lumia 950 XL got fully revealed by a leaked factory CAD render. Typically, factory renders are used in a device’s manufacturing process. Microsoft Lumia 950 XL will measure 151.9 x 78.4 x 7.8 mm. The device’s thickest point at its camera hump will measure 9.9 mm thick. There is no word on the weight of the handset just yet. This means that Microsoft Lumia 950 XL will be slightly shorter and wider than Samsung Galaxy Note5. For comparison, the Korean giant’s flagship phablet measures 153.2 x 76.1 x 7.6 mm. Recently leaked presentation slides confirmed that Microsoft Lumia 950 XL will pack a Qualcomm Snapdragon 810 chipset, 3GB of RAM, 32GB of expandable memory, and 5.7” QHD display. The rest of the device’s lengthy spec sheet includes 20MP PureView camera, 3,300mah battery, USB Type-C port, and support for Qi wireless charging. The Redmond giant’s next-generation flagship smartphone will debut in a little over a week, on October 6 in New York City. Microsoft Lumia 950 and Lumia 550 will also debut alongside the Lumia 950 XL. My 1020 can take brilliant pictures of the moon just by standing in my backyard . And of Jupiter aswell .